The experience of dining out isn't just about the food at Melbourne's themed and generally odd eateries. Here are just a few of the unique experiences you can have over dinner- you definitely won't have to worry about the conversation drying up at these weird venues. 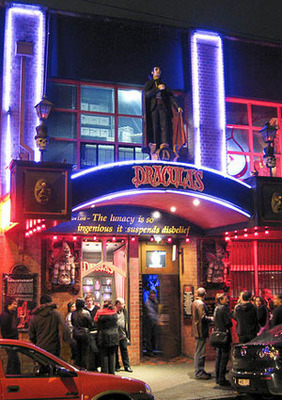 The decadent and spooky Dracula's Cabaret Restaurant entertains diners with their delightfully provocative theatre productions, which bring together comedy, burlesque and novelty acts. Their food, which comes off a pre-set menu with a limited choice of mains, is far better than you would expect. The tickets are divided into A reserve (better view of the show) and B reserve (not as good a view). The A reserve tickets come with a few extra perks, such as a VIP gift bag, a glass of champage and faster admission through the priority entrance queue. On Fridays, Saturdays and public holidays, A reserve tickets are $105 per person and B reserve are $82. From Tuesday to Thursday, A reserve are $95 and B reserve are $74 per ticket. Dracula's is located at 100 Victoria Street, Carlton. Highway 31 is styled as an American diner, decorated with replica mototcycles. 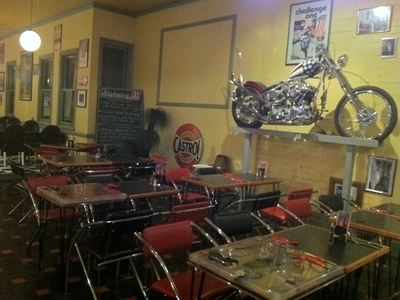 A retro extravaganza, motorcycle themed restaurant Highway 31 serves greasy American cuisine. The extensive memorabilia on display is fun to look at even if you're not a motorbike enthusiast. Highway 31 is quite affordable, with the dishes on their all-day breakfast menu under $15 and burgers under $20. They have a fancier section consisting of gourmet salads, steaks and lamb dishes, most of which are under $30. With a licensed bar, they serve wine and have a large selection of bottled beer. Vegetarian options are available. Highway 31 is located at 745 Sydney Road, Brunswick. Their opening hours are quite erratic- on weekdays, they open from 9:30am to 3:00pm, then close for three hours, and open again from 6:00pm to 10:00pm. On Fridays, they shut at 11:00pm. On weekends, they open from 9:30am to 4:00pm and 6:00pm to 11:00pm (Saturdays) or 10:00pm (Sundays). 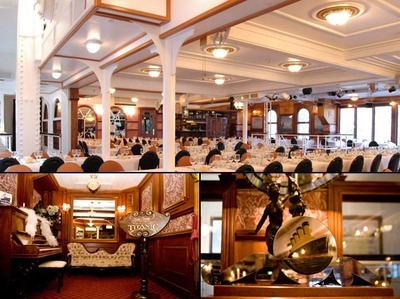 Every Friday and Saturday night, the final dinner on board the Titanic is recreated at the the Titanic Theatre Restaurant. A stage show with special effects aplenty entertains passengers, who are encouraged to don period attire, over dinner. The tragic ending of the real Titanic is replaced by a last-minute miracle, as the passengers are saved by another ship and arrive safely at the dancefloor for an after-dinner dance party. First-class tickets are $100 per person, which includes the entertainment and a three-course meal. The main meal is alternating chicken filled with spinach, feta and sundried tomato; or beef with green peppercorn and mushroom sauce. Steerage tickets, which are suitable for families and more casual dining, are $80 per person. Steerage meals are much nicer than what the actual Titanic's poorer passengers would have dined on, with three decadent courses. Mains are either the same chicken dish as in first-class, or grilled fish coated in lemon sauce. The Titanic Theatre Restaurant is located at 1 Nelson Place, Williamstown. Despite being convincingly styled as a ship and located by the water, the restaurant is in a stationary building. You never know where or what you're eating when you have a Zingara experience. More of a travelling dinner party than a restaurant, each month a group of strangers go to a different mysterious location in Melbourne and enjoy Italian cuisine. Bookings can be made via their website- although expect to be added to a long waiting list. Guests are asked to pay what they think the experience was worth. Why? Because heading to your local pub has been done too many times before.